Let’s be honest – you’ve been dealing with the gaps in your smile longer than you’d like to admit. Since your tooth loss has progressed, dentures are your only option, right? Luckily for you, there are several different options for dental implants in San Antonio when you work with the experts at New Image Dentistry. In this post, they explain the many choices you have to restore the beautiful, healthy smile you deserve. Implant Post – This is made of titanium and is the actual implant itself. It is surgically placed in the jaw and becomes the foundation for the remaining parts of the replacement tooth. Abutment – This is the connecting piece that links the post to the part of the tooth you chew with and see when you smile. Dental Crown – This is the tooth-shaped “cap” that looks and functions just like your original teeth. If you have just one missing tooth in San Antonio, a single implant is an excellent option. And, the other styles of implants are based on the same basic, three-part construction, but we’ll explain more below. 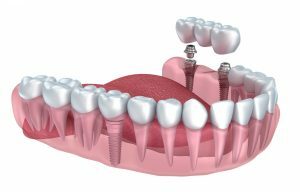 If you have a few missing teeth in a row, we can use two dental implant posts as the anchoring pieces, and then add in pontics (or artificial teeth) to fill in the gaps without placing a large amount of posts. This option offers more security than a traditional, fixed dental bridge, and actually increases the strength and density of your jawbone. Implant-supported dentures provide the best of both worlds when it comes to prosthetic teeth – you’ll get the security and longevity of dental implants, and the ability to replace an entire arch of teeth like you would with dentures. We’ll use anywhere from 4-8 posts and then a snap-in denture that clicks into place or a fixed denture so you won’t have to take your smile out at night. Either way, you won’t have worry about embarrassing slippage when you speak, chew, or kiss your sweetheart. 2×2 – Brush your teeth and implants gently, twice a day, for two minutes, and be sure to floss at least once a day. See Your Dentist – With dental implants, routine oral healthcare is crucial to maintaining your upgraded smile, so see New Image Dental every six months. Limit Sugar – To keep your original teeth healthy and prevent additional tooth loss, avoid sweet foods and beverages that bathe your smile in sugar with each sip. There’s just one exception to the rule – if you have snap-in dentures, you’ll want to take these out and run some tap water over them each time you eat, and soak them in denture cleanser or a solution of vinegar and water at night. Be sure to rinse these thoroughly with water before placing them back in your mouth. Now that you know the options you have to restore your teeth with dental implants, schedule your appointment with New Image Dentistry or contact us if you have questions about making the most of your artificial pearly whites!